Wellington airport is an important city gateway and a significant part of the region’s transport infrastructure. Consequently, when a new airport traffic control tower was required, a range of functional, urban design, safety and sustainability issues had to be addressed. Boffa Miskell was engaged by the Airways Corporation of New Zealand to prepare the resource consent application for the proposed tower, including the assessment of environmental effects, and to present planning evidence at the resource consent hearing. Resource consent was required because the 32.5 metre height, required to give the controllers adequate visibility from the top, exceeded the 12 metre building height limit in the area. Because the control tower would be a tall and prominent building, highly visible from a range of viewpoints, the tower’s design needed to be of a high-quality that would reflect the local environment and context. 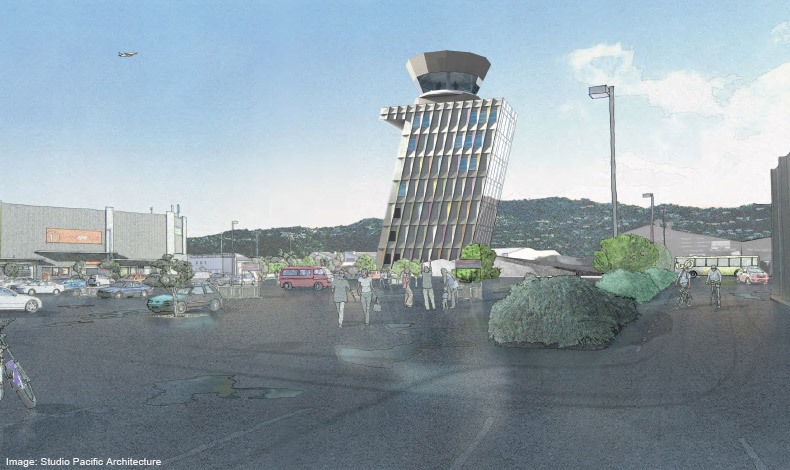 A concept of a ‘leaning tower’ was proposed – an acknowledgement of Wellington’s windy climate and the importance of weather conditions to airport operations. Safety and sustainability of the design in the event of natural disasters was also an important issue, given that post-disaster relief operations are likely to involve air transport. The tower had to be designed to high structural standards to withstand potential earthquake, tsunami and extreme weather events, and have its own emergency power and water supply if required. Boffa Miskell’s planners worked with the client and other project consultants and key stakeholders to identify and address these and other issues that included earthworks on a potentially contaminated site, site security and landscape design to integrate the new facility with its surroundings at ground level. The resource consent application was publicly notified with minimal submissions for a project of such prominence. Resource consent was granted in August 2015 with no subsequent appeals, and construction is expected to be complete by the end of 2016. Planning advice, consultation, compilation of assessment of effects, preparation of resource consent application, presentation of planning evidence at Council hearing.